CHANTILLY, Virginia, April 16, 2019 /PRNewswire/ -- Scan Dimension®, developer of 3D scanners, imaging, and realization technology, today launches SOL, an easy-to-use 3D scanner for the everyday maker, technology enthusiast, and hobbyist. Accurate, portable, and affordable, SOL creates detailed, precise 3D models of scanned objects. "We created the SOL scanner to make 3D scanning approachable for everyone," comments Graham Tinn, CEO of Global Scanning A/S, parent company of Scan Dimension. "SOL empowers anyone to unleash their creativity and explore the infinite possibilities of 3D technology actualization." 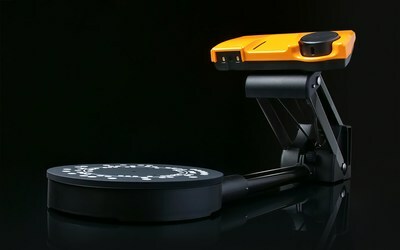 With SOL, users simply place an object on a turntable, cover it with the included tent, and press a button — the laser, camera, and software do the rest. SOL eliminates three important hurdles to 3D scanning: complex calibration, time-consuming software manipulation, and manual mesh alignment. SOL supports both near- and far-mode scanning. In near mode, it can scan an object up to 100 mm in diameter and 100 mm tall (3.9 by 3.9 inches); in far mode, up to 170 mm in diameter and 170 mm tall (6.69 by 6.69 inches). Maximum weight of the scanned object is 2 kg. SOL requires Windows 10 or Mac OS X 10.13, 64-bit dual-core processor, at least 5 GB hard disk space, an OpenGL 3.3+ compatible graphics card and 1024 x 768 pixel display or higher, and 2 available USB 2.0 ports. SOL retails for $599 and is immediately available at https://scandimension.com. Scan Dimension® develops and manufactures solutions that enable high-precision 3D capture across a variety of industries including manufacturing, construction, and engineering. The parent company, Global Scanning A/S Group, is based in Denmark. For more information visit https://scandimension.com.